That’s exactly what happened with Uber when it rebranded for the second time in three years. The Uber brand became associated with negative attention rather than a positive brand experience, and its existing branding was undermining Uber’s marketing efforts. Let’s take a look at why Uber rebranded, the lessons you can learn from their rebrand, and how smart businesses can do the same to protect their brand’s health and success. A great brand starts with a good, memorable company name and professionally designed logo. A company’s name and logo should spark immediate recognition whenever and wherever they appear. A brand is the sum total of the experience your prospects and customers have with your company. A strong brand communicates what your company does, how it does it, and at the same time, establishes trust and credibility with your prospects and customers. Your company’s brand is, in many ways, its personality. Your brand lives in everyday interactions your company has with its prospects and customers, including the images you share, the messages you post on your website, the content of your marketing materials, your presentations and booths at conferences, and your posts on social networks. Successful businesses know that checking on brand health is critical if they want to stay profitable. Ride-sharing juggernaut Uber is all too familiar with checking on brand health. They updated their logo and branding just two years ago. Why did Uber rebrand once again in 2018? 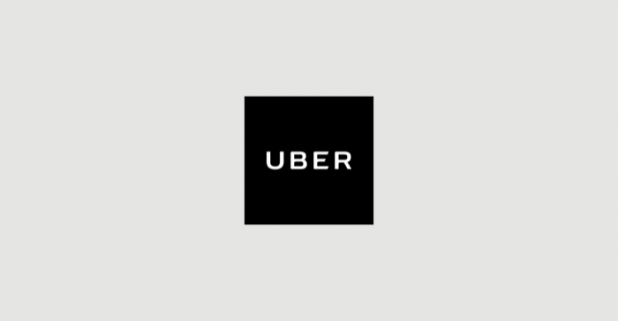 Uber’s previous logo from their 2016 rebrand. Image courtesy of Uber. Uber’s former CEO Travis Kalanick built a hugely successful business, but an increasingly toxic culture had become a poison and tarnished the brand. The old Uber logo emphasized the public’s perception of this hostility, imposing itself on customers with an all-caps, hyper-masculine aesthetic. The word UBER was a visual manspread, evoking the members-only corporate club from Uber’s roots as an on-demand black car service for Silicon Valley’s elite. The need to rebrand was clear: without a complete brand overhaul, Uber risked totaling its business. Uber understood it faced a critical mission: it had to persuade customers that its lousy reputation left the building when its former CEO was replaced. Uber opted for a complete redesign to overhaul the brand from the ground up. To reinforce their newfound dedication to a better customer experience, Uber’s brand strategy started with its most important visual element: their logo. Uber’s new logo is the foundation of a substantial rebranding effort – one that incorporates a sense of mobility, accessibility, and friendliness not found in previous iterations. And in keeping with logo design trends, Uber’s promotional materials showcased how Uber was using its new logo in the real world. A brand is a living document of not only what your company represents it also acts as a vital connection between your customers and your business. Uber’s new logo seeks to do just that. 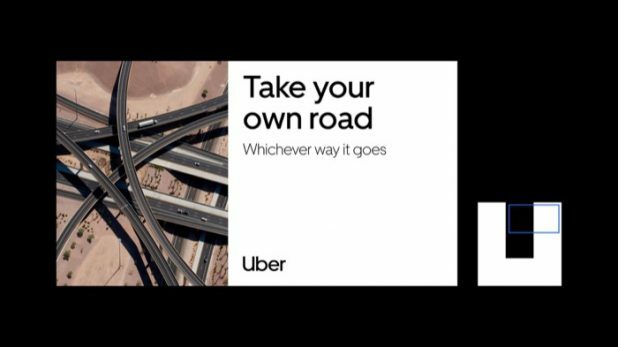 Uber wanted to create a full brand experience, and they considered a broad spectrum of elements to craft it. 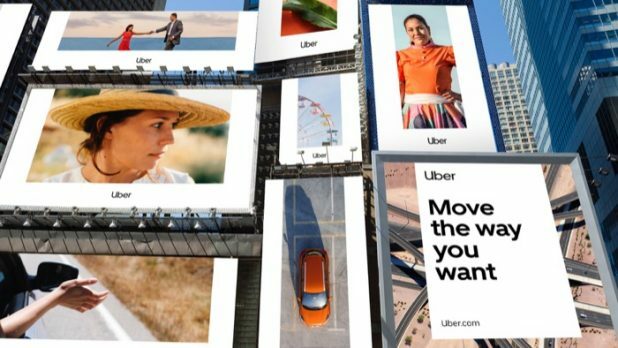 Uber’s redesign includes a custom typeface, photography, illustration, and composition system for layout of advertising and promotional materials. Design studio Wolff-Olins collaborated with Uber’s internal design team to create a brand that would easily adapt to the 660+ cities worldwide where Uber operates. The brand needed to work around the world. Its highest growth areas are in regions outside of the US, such as Latin America and India, where Wolff Olins has a considerable depth of experience. Instead of pursuing a complex identity system, localized through color and pattern, we moved towards a universal ‘beyond-simple’ global brand. Teams in diverse markets can make it relevant to their audiences with culturally specific content. Uber had two key goals when they created their new brand: simplicity and global usage. The result is a clean, fresh look that translates well in any medium or locale. The clean visual break from Uber’s previous brand identity broke ties with their former CEO and toxic culture, pushing the company forward into a new era. This new design is the most clear-cut example in recent memory of a company introducing a new logo to signal change and move away from very recent, very scandalous press. Most redesigns we have seen in recent years are part of positive momentum and while Uber surely has some of that going in its favor, this logo’s primary job is try to get as many people as possible to put as much of Uber’s past in the past. Uber’s rebrand is a powerful example of how design can influence consumer opinion. It’s important to equip your business with equally powerful strategies when it’s time for your own rebrand. Make sure your new branding is used consistently anywhere your customers engage with your business. Take advantage of every branding opportunity. Incorporate your new logo or a related brand message everywhere you can. Use a style guide. Give your employees easy-to-use tools and resources to make it easy to follow your new branding guidelines to the letter. Listen to your customers. Use valuable customer feedback to keep your brand relevant and reflective of their wants and needs. Introduce your rebranding efforts thoughtfully and methodically. Make sure you keep your customers engaged and informed while you roll out your new brand experience. Your business may not have to distance itself from the negative legacy Uber faced. But if you feel that your brand isn’t keeping up with the times or you’re not able to grow your business as fast as you want, consider a rebrand. A smart and carefully considered design strategy will drive your rebrand straight to success. What is a Landing Page and How Can I Make More Money With One?